Physical Therapist Renee Parsons ensures Hope is safe and secure on the adaptive bike. Hope Palmer loves the color purple. 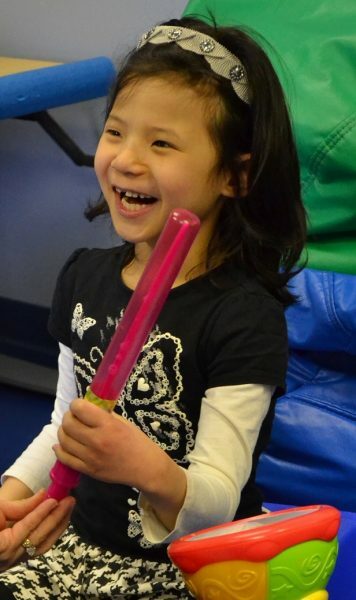 She has a contagious smile, plays hard and is determined to keep up with her three older sisters. Hope works her left arm in occupational therapy by playing a drum. Hope has made great progress so far. She’s learning how to pedal and steer an adaptive bike, for example, so she’ll be able to ride with her sisters. She’s also learning English, naming colors and alphabet letters during occupational therapy.